There are Definitely Enough Things to Do in Podgorica. Is Podgorica worth visiting? We think so! With a historic old town, a small city feel, a beautiful river, and a lively core with lots of nature – there’s something for everyone in Podgorica. We’re told the nightlife in Podgorica is a great time. We only stayed for one night so we didn’t get a chance to discover the nightlife but the areas with the bars and clubs number them in the dozens. For such a small capital city, you’ll see how this can be a lot! We kept reading articles that Podgorica was “Europe’s Most Boring Capital” and we don’t think that’s true at all. Having said that, Podgorica is a city you’ll fly into to begin an adventure or stop by to see if you’re in the area. As long as you don’t plan to spend a whole week there, you’ll have enough things to do in Podgorica. 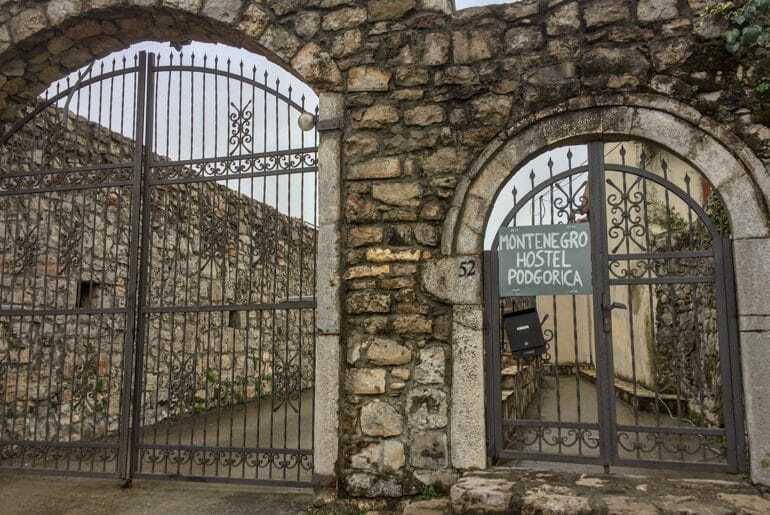 Often times, travellers don’t even know that Podgorica is the capital of Montenegro, let alone that Montenegro is a country and not a city itself. 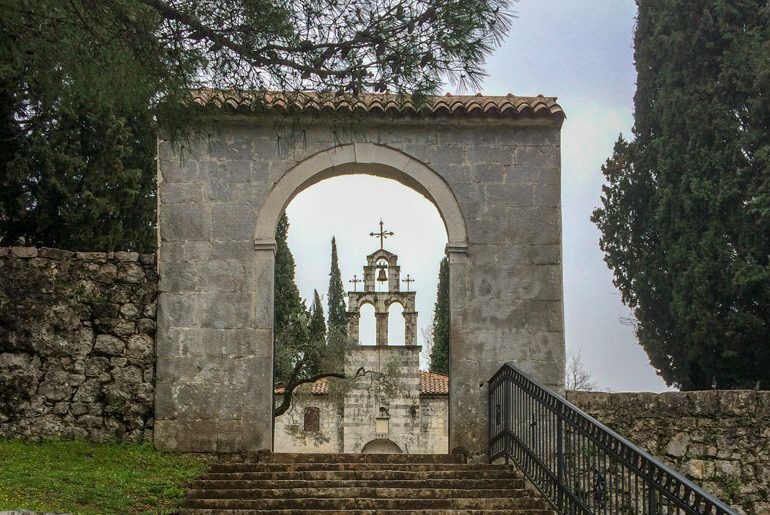 We’ve heard that before – and it doesn’t take much googling to find that people legitimately ask “what country is Montenegro in?” That’s why we visited and wanted to write all about Montenegro and Podgorica. The views of the mountains from the within the city are stunning from anywhere you stand. Oh, and you’ll even be treated to the famous Niagara Waterfall just outside Podgorica that is sure to impress! We feel like many people know very little about Montenegro, let alone the entire area of Southern Europe called The Balkans. They are beautiful – and certainly worth visiting if you’re looking for places that aren’t necessarily on the beaten path. Not to say that no tourists visit – Croatia and Slovenia can get quite busy. But there are other countries (like Bosnia and Herzegovina) that are perfect for exploring if you’re willing to go the extra mile. 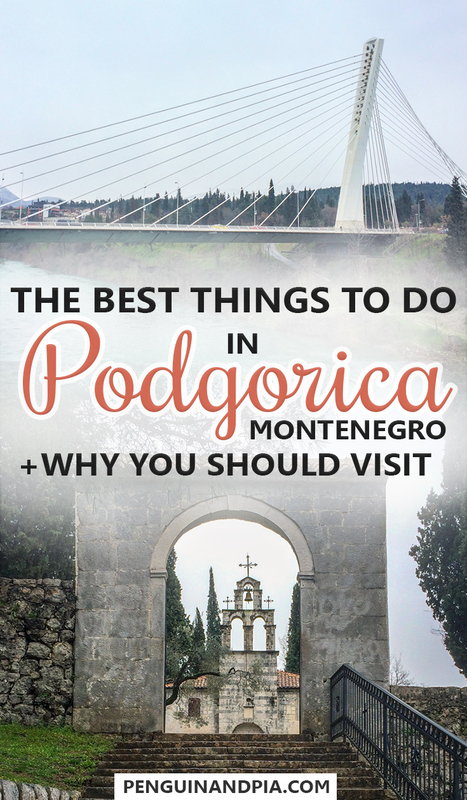 That said, as we write more and more about Montenegro, you’ll find day trips from Podgorica as well as the other towns and cities along the coast covering things to do in Kotor, Herceg Novi, Ulcinj, and even things to do in Budva! Ready to learn about the Podgorica highlights? Let’s dive into learning about Podgorica, and why it should be on your destination list if you’re travelling to the Balkans. Even though the weather wasn’t great and we didn’t have a stabilizer, we filmed a really short video to give you a sample of what the capital looks like – the quality is admittedly terrible, but we wanted to share it anyways. You can either watch the snipppet below or find the whole video on our YouTube Channel here. Podgorica is the capital of Montenegro. You’ll find it located about one hour from the Adriatic Coast and towns like Budva or Kotor, and about an hour to the mountains where you can enjoy skiing in the right season. Essentially, Podgorica makes for a great starting point if you’re heading anywhere in Montenegro from far outside the country. Podgorica is named after the hill that it lies at the base of – Gorica. Pod loosely means “under” and so Podgorica is “under Gorica hill”. Makes sense! Podgorica was actually named Titograd during the time in which it was part of the former Yugoslavia (1920s -1990s). The leader at the time, Josip Broz Tito, named the capital to honour himself. There are a few ways to get to Podgorica: plane, bus, train, and car. Each of them come with their pros and cons and also depend heavily on where you are travelling from. We flew in but we were coming from Budapest so it was the easiest option. We flew with Wizz Air, which is the budget airline for Eastern Europe. We’ve actually flew with them a handful of times in the past few months and have writing a whole post about our experiences with Wizz. The airport is south of the city centre by about 14 km so it’s decently far. There are two main ways t get into the city centre: taxi or train. We just hopped in a cab because, frankly, we had no idea the train existed. Cabs are grabbed just outside of arrivals and it should be a flat rate of 12 euro. There is a train from the airport, but apparently, the airport information desks will deny its existence so that you take a cab. The stop is called “Aerodrom” and it’s a five minute walk from the airport. The ticket will be loads cheaper than a cab fare, although we didn’t do this option and we’ve only heard about to from other travellers so tread carefully. We took the bus out of Podgorica to Herceg Novi and it was a very simple process. The bus terminal (at the train station) is quite good with buses clearly marked with signs and tickets indicating the bus company operating that route. Buses run frequently from the coastal towns and will get you into Podgorica in under 2 hours. If you’re coming from outside Montenegro, like Dubrovnik, just know that you’ll have to cross through border checks with stamps in passports either on or off the bus. In any case, the website to check bus times in this region of the Balkans is BusTicket4.me. You can buy the ticket online if you want, but most of the time you’ll be fine buying it at the station before departure. The train into Podgorica goes form places like Belgrade, Serbia and other places nearby. Generally, however, there are not many train routes and Belgrade seems to be the only international connection. Train tickets will vary and the costs will also greatly depend on the distance. We’d recommend using Rome2Rio for these routes since the official train websites weren’t overly helpful. You can’t talk about the history of the Balkan region without acknowledging the complicated geopolitical, cultural, and ethnic tensions that existed (and in places, continue to exist) in the former Yugoslav Republic. The breakup of Yugoslavia in the early 1990s began a series of separate but interconnected wars in the Balkan region that resulted in a historical atrocities, human rights violations, cultural upheaval, overall, a destabilization of the region. We won’t get too far into the conflicts in this post. We can, however, say that today almost 30 years later many of the scars can still be seen in different cities like Sarajevo, in Bosnia and Herzegovina. For Montenegro, as of the early 2000s after much of the dust had literally settled, Serbia and Montenegro were joined as one state. In 2006, Montenegro and Serbia parted ways, each declaring independence from one another via referendum. 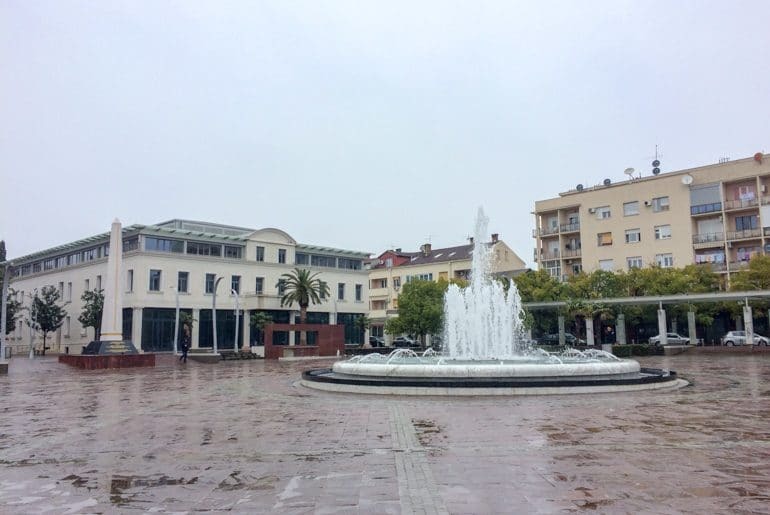 During World War II, Podgorica was almost entirely flattened but has since been rebuilt during both the communist-era and the modern decades since the fall of the Yugoslav republic. As a result, you’ll find a mix of Ottoman Turkish old town architecture, housing and buildings resembling other Eastern Bloc countries, along with both ancient ruins from centuries ago AND modern glass and steel structures as the city grows and develops its identity and place in Europe. Podgorica doesn’t have a ton of accommodation options but there are certainly enough to meet the needs of backpackers, budget travellers, or upscale travellers. We stayed in a hostel that was very highly rated but we walked by numerous hotels that looked quite nice. Below, we’ve included our experience at the hostel we stayed at and we also recommend one hotel that we want to stay when we head back! We really liked staying in Montenegro Hostel. In fact, it made our massive list of great European hostels we loved staying at. It’s located in the old town of Podgorica – right along the river bank. The hostel itself is one large house that’s in its own little gated complex with stone walls and a nice grassy area for lounging in the backyard. There’s even a rooftop terrace where you can get great views of the surrounding city. There are washrooms on each floor, a communal kitchen for your usage, and breakfast was included in our stay. The host serves you a traditional pastry filled with cheese that is really really delicious and a yogurt with coffee. Lisa really liked the pastry and for once – Eric got full which doesn’t happen often! (He likes food). We booked the private room because we wanted a decent night’s sleep seeing as we were “on the road” at that time and also needed to work. The hostel wasn’t very busy in the season anyways but the few other backpackers in the common room were nice enough for some small talk. If you want a quick and easy place to stay for cheap that’s safe and secure with good hospitality, then book a stay at Montenegro Hostel. Located very close to our hostel we walked by Hotel M Nikic many times and always noticed the flags from all different countries hanging over the front door. Hotel M Nikic is a super quick walk to the main city centre and very close to the train/bus station in Podgorica. It looked really impressive – and now that we’ve researched it more, we definitely want to stay there! The modern rooms are bright and each come with an ensuite bathroom. Almost all the rooms have a city view or a view of the river and come with robes and slippers for extra comfort. There’s an onsite restaurant, 24-hour reception, and there’s even breakfast included. Guests consistently comment on how clean the hotel is, how nice the staff are, and how great the location is. Having seen it ourselves – that last one is certainly not an exaggeration. Check the prices for your stay at Hotel M Nikic here. Podgorica is great because, admittedly, the city so small and you can see many things in and around the city centre in just a few hours. If you’re staying for a few days, then you’ll get the opportunity to venture on a few half or full day trips to discover hikes and other natural wonders. We only had one day to really explore and it was raining/sleeting so we made the most of our wander! 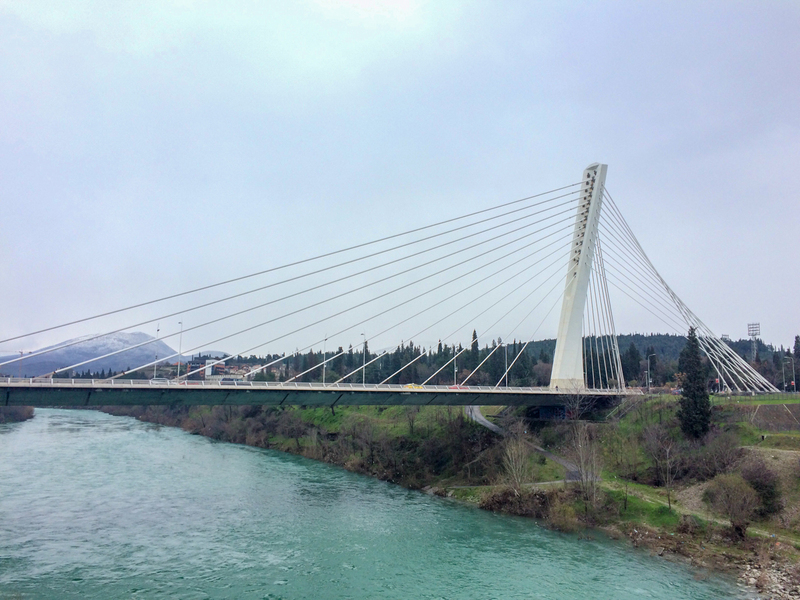 Here’s a short list of the things we saw and did in Podgorica! One of the coolest things to see in the capital is the Millennium Bridge over the Morača river. Built in 2005, this bridge spans the river and connects the two sides to the city. We walked across and got great views of the super blue river and the mountains in the background. 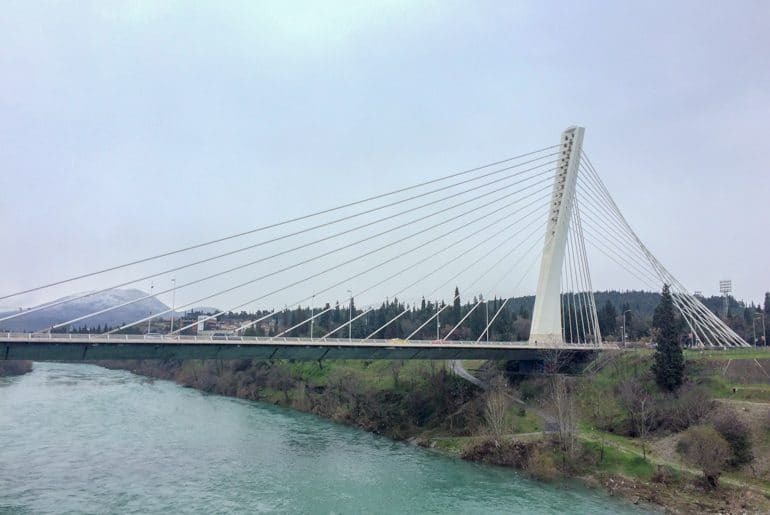 Podgorica is pretty proud of the bridge so be sure to go and see it. As span bridges go, it’s a pretty impressive feat of engineering. Also called Hram Hristog Vaskrsenja, this cathedral is a beautiful and creative addition to the city’s architecture. Built back in 1993, this Serbian Orthodox Cathedral is an active place of worship. The church itself only took about a decade to build – but you’d think it took longer based on the detail of the stonework on the exterior. The cathedral is located in the city centre so it’s easy to walk to – you just have to cross the bridge if you are staying in the Old Town or close by. If you are visiting, do remember that it’s an orthodox church so dressing modestly is appropriate and respectful. This means covering shoulders, arms, and legs/feet. Called Crkva Svetog Đorđa, St. George’s Church is the oldest church in Podgorica. They even have active masses there to this day. Built between the 9th and 11th century, there have been additions from arches and frescos added over the centuries. We wandered inside and it was small but beautiful to check out. There’s only so many places that are old and you can actually feel how old they are when you’re there. That’s this church. The church itself is located near the soccer stadium nestled away under trees at the base of Gorica hill. What we didn’t realize was that if you wander behind the church, there is an overgrown cemetery that’s apparently creepy (but okay) to wander through. 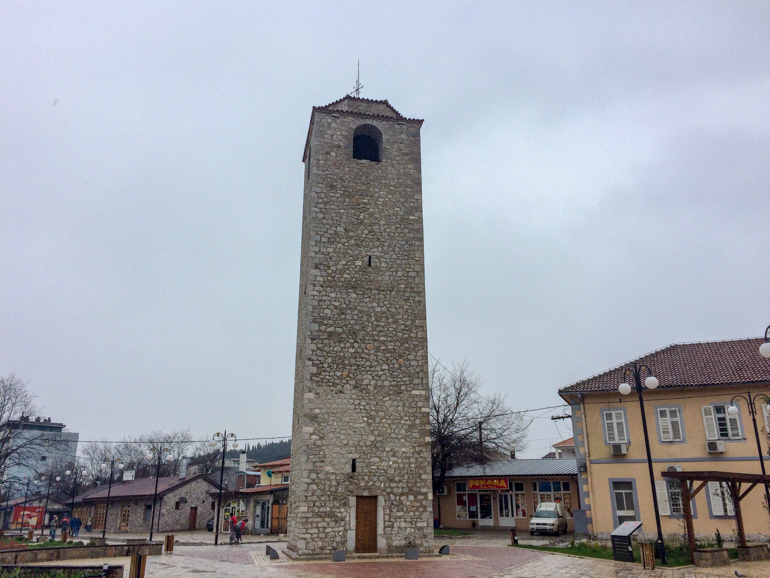 The oldest parts of town were built by the Turkish inhabitants during their rule in Montenegro. As a result, you can find two mosques in the old town as well as the clock tower below. If you look close enough, you’ll find remnants of the Turkish influence on Podgorica around the city but much of it was destroyed by heavy bombing during World War II. Our hostel is located in the Old Town and walking to it from the main city streets is a fun adventure of curved streets and old alleyways. Nearby to the old town, you’ll find the ruins of the ancient town/settlement along the Ribnica River. You can cross the bridge that was built by the Romans and renovated by the Turks during their rule. The grounds are full of little paths and stairs to wander through and it’s very green close to the river so you can certainly enjoy nature while in the city centre. Pod Volat, the restaurant we talk about below, is actually on the far left side of this photo! Built back in 1667 by the Ottoman Turks, the stone clock tower is a 19 metre tall is a highlight of the Old Town. It’s cool to look at – but you can’t go inside or anything. You just take photos of it. Luckily, Pod Volat (the greatest restaurant) is located right beside so if you’re lost and hungry you’ll know where to do for dinner. Spoiler alert: You won’t get lost in Podgorica. This seems like an obvious one – but you can hike up to the top of Gorica Hill to get great views of the city. Our hostel host told us to go and marked it on the map but we didn’t get a chance because of the heavy rain. The paths are located right beside St. George’s Church and we saw a couple people coming back down. If you’re heading up there and looking for more adventure, Podgorica has an adventure park with ropes courses and obstacles that can be done by the whole family. Admission is a small fee but the green surroundings are tranquil and we’re told it’s worth the fees for the experience! To learn more, you can check them out here. Independence Square was called Trg Ivana Milutinovića (after the communist politician and national hero) until 2006 when it was renamed and removed to be widened, paved, and beautified after Montenegro’s Independence. If you find yourself here, you’ll find yourself in “New Town” where all the bars, restaurants, and clubs are. Our hostel has told us there were over a few dozen bars in one of the areas and even more in another. Whether he was estimating or not – there was quite a few places to go out. We heard the nightlife was quite good (in the busy season) so we’ll have to return in the summer when the weather is nicer for patio drinks in Podgorica. The nice thing about Podgorica is that there are a few things that you can do and see if you’re willing to make a short adventure form the city centre. Most of the things are of the sort that would attract nature lovers, but the two recommended trips are certainly for anyone to enjoy! This freshwater lake is the largest of its kind in the Balkans. Located only 20 minutes from the city centre by car and straddling the border of Montenegro and Albania, it’s a great half-day trip for those looking to explore nature and go for a dip in the hot summer. You’ll find locals hanging out but everyone is welcome. It can get busy in the summertime as visitors to the surrounding towns in both countries make the trip to Skadar. These ruins are located just north outside the city and reachable by car. They date from the 5th century and the site had been studied extensively over the decades. Unfortunately, the site is pretty unmarked and unknown. You’ll come across large stones that seem to be just sitting in a field – little do most people realize that it’s ancient ruins from the old city and a significant piece of history in the area. We had heard about the famous waterfall that was outside the city on the Cijevna River. The idea for a side trip was reinforced when another hostel worker mentioned that we jump into a cab and go. It was raining, and we did have to get some work done so we didn’t end up going and looking back we regret it just a little bit. Google the photos – it looks gorgeous! We plan on returning to Podgorica anyways so we will most certainly check it out when we are back. Apparently when it’s dry in the summer the water can lessen so be sure that there’s water when you go – and you can also go swimming nearby! 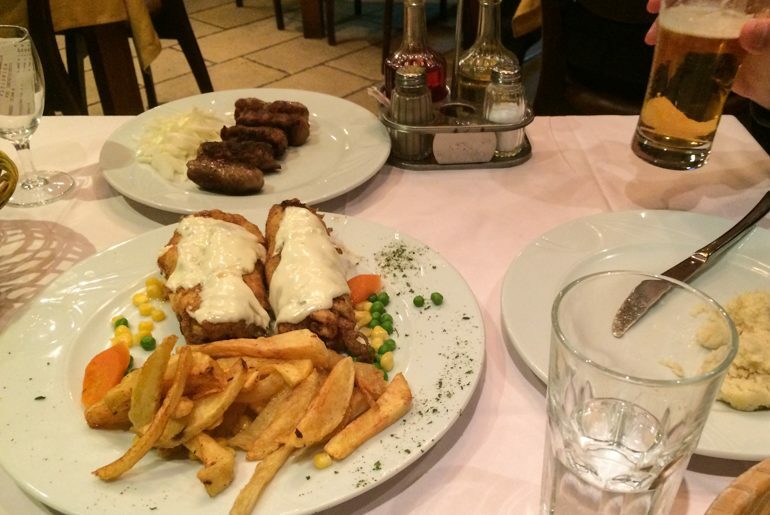 Podgorica is a small city but that doesn’t mean there is a shortage of good places to eat. A quick search will tell you that there are quite a few places dotted across the city – with a variety of places to go for food and drinks behind Independence Square in the main city centre. There are also a ton of nice looking cafes that we walked by and felt were “our kind of vibe” but we had already had a coffee so we didn’t need to stop! We were only in Podgorica for the better part of one day and so we had the chance to eat out just a handful of time. 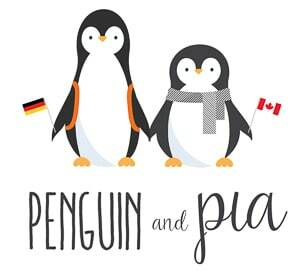 Here are two of the places we ventured to and would recommend! If you visit Podgorica, you have to visit Pod Volat. We had researched what the best restaurant for dinner might be and, according to Google reviews, we had already decided on heading there because we wanted a traditional meal in Montenegro while we were there. It was even close to our hostel! Sure enough, we get to the hostel and the host sat us down with a map of the things we needed to know. Almost immediately, he pointed to Pod Volat and said: “Go there for a traditional Montenegrin/Bosnian meal”. He wrote down three things we had to try – and even showed us photos of the dished on the computer. What a guy. Pod did not disappoint. The food was amazing and came in huge portions. The waiter we had was super nice and didn’t even laugh when we pulled out the city map (discretely) and asked for cevapi, potato dish, and the cream roll meat thing. Honestly, we felt a little out of place as foreigners among the locals but we had such great service. He was kind, walked us through the options and portions, and allowed us to have a great experience. As such, we tipped him generously which he didn’t expect. He showed his graciousness towards us even more after that. It was honestly great. We weren’t actually at all “out of place” – that was something WE just perceive about ourselves when we travel. It’s good to be aware of it. We certainly aren’t the most embarrassing tourists but we were certainly more than he’s used to in the off-season. Anyways, go to Pod Volat and see for yourself. The hostel owner had written down a pizza place that he said had really cheap pizza that was also really delicious. Having not had a slice in awhile, we decided t check it out if we passed by it while out on our wander. Pizzeria Presto wasn’t that place! We couldn’t find it based on the writing on the map. So, how did we find Pizzeria Presto? Well, while wandering the area with all the restaurants, pubs, and clubs in the city centre – we walked by it more than a few times while looking for the other one. Finally, we got hungry, gave up looking, and went there. The staff were super nice – we asked if they had any fresh slices coming and they said “well just make you a whole pizza – come inside!” Four euro for a margarita pizza for two? Not bad at all! The women even asked where we were from. We began to realize just how nice the people in Montenegro (or, at least in Podgorica) were. Address: On the corner close to the Scottish Pub – you can’t miss it if you walk around the area. And there you have it – our take on Podgorica. Obviously, the city isn’t huge and so we don’t recommend spending loads of time there. That said, we certainly feel that it’s worth checking out if you’re passing through Montenegro or flying into Podgorica to start a Balkan adventure. Have you been to Montenegro before? What did you think? Let us know in the comments below – we’d love to know what you thought of the small capital city! I have a soft spot for lesser travelled places, so I really appreciate this article! I would love to see the wildly varied architecture in Podgorica from all of the different historical eras. The food sounds awesome as well!